The name brandy comes from the Dutch word brandewijn, meaning "burnt wine." The name is apt as most brandies are made by applying heat, originally from open flames, to wine. The heat drives out and concentrates the alcohol naturally present in the wine. Because alcohol has a lower boiling point (172°F, 78°C) than water (212'F, 100°C), it can be boiled off while the water portion of the wine remains in the still. Heating a liquid to separate components with different boiling points is called heat distillation. While brandies are usually made from wine or other fermented fruit juices, it can be distilled from any liquid that contains sugar. All that is required is that the liquid be allowed to ferment and that the resulting mildly-alcoholic product not be heated past the boiling point of water. The low-boiling point liquids distilled from wine include almost all of the alcohol, a small amount of water, and many of the wine's organic chemicals. It is these chemicals that give brandy its taste and aroma. Almost every people have their own national brandy, many of which are not made from wine: grappa in Italy is made from grape skins, slivivitz in Poland is made from plums, shochu in Japan is made from rice, and bourbon in the United States is made from corn. Beer brandy is better known as Scotch whiskey. It is universally acknowledged that the finest brandies are the French cognacs that are distilled from wine. Brandies are easy to manufacture. A fermented liquid is boiled at a temperature between the boiling point of ethyl alcohol and the boiling point of water. The resulting vapors are collected and cooled. The cooled vapors contain most of the alcohol from the original liquid along with some of its water. To drive out more of the water, always saving the alcohol, the distillation process can be repeated several times depending on the alcohol content desired. This process is used to produce both fine and mass-produced brandy, though the final products are dramatically different. It is unknown when people discovered that food could be converted to alcohol through fermentation. It appears that the discovery of fermentation occurred simultaneously with the rise of the first civilizations, which may not be a coincidence. At about the same time that people in Europe discovered that apple and grape juice—both containing fructose—would ferment into hard cider and wine, people in the Middle East discovered that grains—which contain maltose—would naturally ferment into beer, and people in Asia discovered that horse milk—containing lactose—would naturally ferment into airag. The first distilled liquor may in fact have been horse milk brandy, with the alcohol separated from fermented horses' milk by freezing out the water during the harsh Mongolian winter. It is also not known when it was discovered that the alcohol in fermented liquids could be concentrated by heat distillation. Distilled spirits were made in India as long ago as 800 B.C. The Arabic scientist Jabir ibn Hayyan, known as Geber in the West, described distillation in detail in the eighth century. Regardless of its origin, alcohol was immensely important in the ancient world. In Latin, brandy is known as aqua vitae, which translates as "water of life." The French still refer to brandy as eau de vie meaning exactly the same thing. The word whiskey comes from the Gaelic phrase uisge beatha also meaning water of life. People in the Middle Ages attributed magical, medicinal properties to distilled spirits, recommending it as a cure for almost every health problem. The raw materials used in brandy production are liquids that contain any form of sugar. French brandies are made from the wine of the St. Émillion, Colombard (or Folle Blanche) grapes. However, anything that will ferment can be distilled and turned into a brandy. Grapes, apples, blackberries, sugar cane, honey, milk, rice, wheat, corn, potatoes, and rye are all commonly fermented and distilled. In a time of shortage, desperate people will substitute anything to have access to alcohol. During World War II, people in London made wine out of cabbage leaves and carrot peels, which they subsequently distilled to produce what must have been a truly vile form of brandy. Heat, used to warm the stills, is the other main raw material required for brandy production. In France, the stills are usually heated with natural gas. During the Middle Ages it would have required about 20 ft 4 of wood (0.6 m 4 ) to produce 25 gal (100 l) of brandy. The fine brandy maker's objective is to capture the alcohol and agreeable aromas of the underlying fruit, and leave all of the off-tastes and bitter chemicals behind in the waste water. Making fine brandy is an art that balances the requirement to remove the undesirable flavors with the necessity of preserving the character of the underlying fruit. Mass-produced brandies can be made out of anything as the intent of the people is to remove all of the flavors, both good or bad, and produce nothing but alcohol—taste is added later. Fine brandies are required to retain the concentrated flavor of the underlying fruit. The Eighteenth Amendment made it a crime to make, sell, transport, import, or export liquor. It is the only amendment to be repealed by another (the Twenty-first). The Prohibition era (1920-1933) had been a long time in coming. From the mid-nineteenth century through the beginning of World War I, a growing movement demanded a prohibition on alcohol. When members of Congress finally bowed to pressure from prohibition supporters and passed a constitutional amendment, many did so under the belief that it would not be endorsed by the states. In fact, a clause was added to make it more likely not be sanctioned: if three-quarters of the states did not ratify the amendment before seven years had expired, it would be deemed inoperative. The amendment was passed by Congress in December 1917 and ratified by three-quarters of the states by January 1919. The popularity of the amendment disappeared soon after it was put into effect. The Volstead Act of 1919 banned beer and wine, something few people had anticipated, and in the minds of many Prohibition became a mistake. Crime rose as gangsters took advantage of the ban on alcohol by making huge profits in bootlegging and smuggling. When Franklin D. Roosevelt campaigned for president in 1932, he called for the repeal of Prohibition. His opponent, President Herbert Hoover, called it "an experiment noble in motive." Roosevelt won the election and his Democratic party won control of the government. Within months the Eighteenth Amendment was repealed. The first step in making fine brandies is to allow the fruit juice (typically grape) to ferment. This usually means placing the juice, or must as it is known in the distilling trade, in a large vat at 68-77°F (20-25°C) and leaving it for five days. During this period, natural yeast present in the distillery environment will ferment the sugar present in the must into alcohol and carbon dioxide. The white wine grapes used for most fine brandy usually ferment to an alcohol content of around 10%. Fine brandies are always made in small batches using pot stills. A pot still is simply a large pot, usually made out of copper, with a bulbous top. 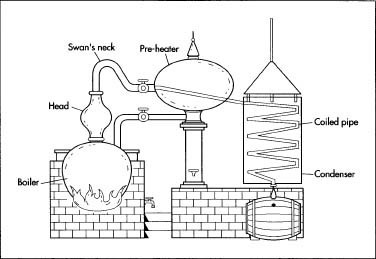 The pot still is heated to the point where the fermented liquid reaches the boiling point of alcohol. The alcohol vapors, which contain a large amount of water vapor, rise in the still into the bulbous top. The vapors are funneled from the pot still through a bent pipe to a condenser where the vapors are chilled, condensing the vapors back to a liquid with a much higher alcohol content. The purpose of the bulbous top and bent pipe is to allow undesirable compounds to condense and fall back into the still. Thus, these elements do not end up in the final product. Most fine brandy makers double distill their brandy, meaning they concentrate the alcohol twice. It takes about 9 gal (34 1) of wine to make I gal (3.8 1) of brandy. After the first distillation, which takes about eight hours, 3,500 gal (13,249 1) of wine have been converted to about 1,200 gal (4,542 1) of concentrated liquid (not yet brandy) with an alcohol content of 26-32%. The French limit the second distillation (la bonne chauffe) to batches of 660 gal (2,498 1). The product of the second distillation has an alcohol content of around 72%. The higher the alcohol content the more neutral (tasteless) the brandy will be. The lower the alcohol content, the more of the underlying flavors will remain in the brandy, but there is a much greater chance that off flavors will also make their way into the final product. The brandy is not yet ready to drink after the second distillation. It must first be placed in oak casks and allowed to age, an important step in the production process. Most brandy consumed today, even fine brandy, is less than six years old. However, some fine brandies are more than 50 years old. As the brandy ages, it absorbs flavors from the oak while its own structure softens, becoming less astringent. Through evaporation, brandy will lose about 1% of its alcohol per year for the first 50 years or so it is "on oak." Fine brandy can be ready for bottling after two years, some after six years, and some not for decades. Some French cognacs are alleged to be from the time of Napoleon. However, these claims are unlikely to be true. A ploy used by the cognac makers is to continually remove 90% of the cognac from an old barrel and then refill it with younger brandy. It does not take many repetitions of this tactic to dilute any trace of the Napoleonic-age brandy. Fine brandies are usually blended from many different barrels over a number of vintages. Some cognacs can contain brandy from up to a 100 different barrels. Because most brandies have not spent 50 years in the barrel, which would naturally reduce their alcohol contents to the traditional 40%, the blends are diluted with distilled water until they reach the proper alcohol content. Sugar, to simulate age in young brandies, is added along with a little caramel to obtain a uniform color consistency across the entire production run. The resulting product can cost anywhere from $25 to $500 or even more for very rare brandy. Mass-produced brandy, other than having the same alcohol content, has very little in common with fine brandy. Both start with wine, though the mass-produced brandies are likely to be made from table grape varieties like the Thompson Seedless rather than from fine wine grapes. Instead of the painstaking double distillation in small batches, mass-produced brandies are made via fractional distillation in column stills. Column stills are sometimes called continuous stills as raw material is continuously poured into the top while the final product and wastes continuously come out of the side and bottom. A column still is about 30-ft (9-m) high and contains a series of horizontal, hollow baffles that are interconnected. Hot wine is poured into the top of the column while steam is run through the hollow baffles; the steam and wine do not mix directly. The alcohol and other low boiling point liquids in the wine evaporate. The vapors rise while the non-alcoholic liquids fall. As the still is cooler at the top, the rising vapors eventually get to a part of the still where they will condense, each type of vapor at a temperature just above its own boiling point. Once they have recondensed, the liquids begin to move downward in the still. As they fall, they boil again. This process of boiling and condensing, rising and falling, happens over and over again in the column. The various components of the wine fraction and collect in the column where the temperature is just below the boiling point of that component. This allows the ethyl alcohol condensate to be bled out of the column at the height where it collects. The resulting product is a pure spirit, colorless, odorless, and tasteless, with an alcohol content of about 96.5%. At 96.5% alcohol, it can be used to fuel automobiles. It can be diluted and called vodka or diluted and flavored with juniper berries and called gin. Mass-produced brandies are also aged in oak casks and pick up some flavors from them. Like its fine counterpart, the brandies are blended, diluted to around 40% alcohol, and bottled. The quality control process for fine brandies involves trained tasters with years of experience sampling brandy. A large cognac house might have 10,000 barrels of brandy in its cellars, each of which must be tasted annually. Hence, most of the brandy "tasting" involves only smelling, as tasting several hundred barrels of brandy in a day would result in alcohol poisoning. The tasters usually "taste" each of the barrels at least once a year to assess how it is aging and to evaluate it for its blending qualities. Brandies that pick up off-flavors during distillation are discarded. As mass-produced brandies are manufactured to be odorless and tasteless, the only real quality control required is to check their alcohol content. Because alcohol is less dense than water, the alcohol content of brandy can be checked with a hydrometer. A hydrometer is a glass float with a rod sticking out the top of it. The rod is calibrated so that a line on the rod will be exactly at the liquid surface if the hydrometer is floating in water. As alcohol is less dense than water, the hydrometer will sink deeper in alcohol than it will in water. By calibrating the rod scale with different blends of known alcohol content, it can be used to determine the percentage of alcohol in a water/alcohol mixture. The waste products from brandy production include the solids from the wine production and the liquids left over from the still. The solids from brandy production can be used for animal feed or be composted. The liquid wastes are usually allowed to evaporate in shallow ponds. This allows the residual alcohol in the waste to go into the atmosphere, but the United States Environmental Protection Agency does not consider this to be a major pollutant source. For the foreseeable future, the vast bulk of all the brandies will be produced in column stills. However, there is an increasing interest in luxury goods throughout the world. Not just fine brandies, but Calvados (fine apple brandy) and slivovitz (fine plum brandy) are getting increasing amounts of attention from collectors and ordinary citizens. Faith, Nicholas. Cognac. Boston: David R. Godine Publisher, 1987. Harper, William. Origins and Rise of the British Distillery. Lewiston, U.K.: The Edwin Mellen Press, 1999. Kummer, Corby. "Don't Call It Cognac." Atlantic Magazine (December 1995). United States Environmental Protection Agency. Emission Factor Documentation for AP-42, Section 9.12.2, Wines and Brandy. (October 1995). Stability of wine brandy concentrates was studied depending on temperature and duration of the cold treatment. The waste products from making brandy could be very valuable. They probably contain a large amount of resveratrol, which, in large quantities, retards aging. To get the same effects they get in mice, one would have to drink 1,000 bottles of wine a day. But the dregs from brandy making would have that much in a small volume. It would be cheap not to refine the resveratrol, but to consume the product as is. That might be made into soft or crisp bars, or compressed into pills. It might be sprinkled onto food, or if it doesn't taste too bad, it might be mixed with some water and made into a drink. Of course, if the resveratrol were purified out, then at a hopefully reasonable cost, the concentrated stuff might be provided in quantities that would matter if consumed.